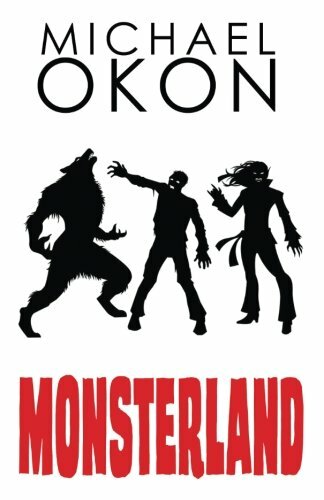 Michael Okon is an award-winning and best-selling author of multiple genres including paranormal, thriller, horror, action/adventure and self-help. He graduated from Long Island University with a degree in English, and then later received his MBA in business and finance. Coming from a family of writers, he has storytelling is his DNA. Michael has been writing from as far back as he can remember, his inspiration being his love for films and their impact on his life. From the time he saw The Goonies, he was hooked on the idea of entertaining people through unforgettable characters. Michael is a lifelong movie buff, a music playlist aficionado, and a sucker for self-help books. He lives on the North Shore of Long Island with his wife and children. Hi Michael, what can you tell us about your writing journey? It’s a pretty incredible story that I have a hard time believing. I wrote Monsterland and self-published it in 2015. My mom is my publicity manager and she blitzed the bloggers with my book. That fall I was reading a book called Selling a Screenplay by Syd Field. In the book, there was an entertainment attorney named Susan Grode who seemed very knowledgeable about the publishing and film industry. I told myself, when I receive my first contract, I’m going to reach out to her to see if she could help me. About two months later, I received a post on Facebook from an agent in London who asked to represent me. I said sure and asked him to send me a contract. I emailed Susan and introduced myself and mentioned that I had someone who wanted to rep me and I was hoping she could read this contract. She told me before I sign with this London agent, why don’t I meet her friend in Brooklyn, an agent named Nick Mullendore with Vertical Ink Literary Agency. I met Nick for lunch and he signed me that day as his client. That evening, Susan brought me on as her client as well. Nick began trying to sell my book, Monsterland, to the publishers and it was rejected. Throughout his attempts of selling, he had a call with a film agent and he was pitching her a romance novel. She said she wasn’t really into romance and was looking for something with monsters. He sent her my book Monsterland, she read it over a weekend, and we had a call that Monday. She told Nick and me if we get the book published, she will get it into a producer’s hands to make into a film. Nick found the publisher WordFire Press, owned by Kevin J. Anderson, who has written all the Star Wars and Dune canon books. WordFire signed me to a two-book deal for Monsterland 1 & 2. After the deal was signed, my film agent did what she promised and got my book into the hands of a billion-dollar grossing producer who is now shopping my book to certain studios. It’s been a wild two years. Wyatt Baldwin's senior year is not going well. His parents divorce, then his dad mysteriously dies. He’s not exactly comfortable with his new stepfather, Carter White, either. An ongoing debate with his best friends Melvin and Howard Drucker over which monster is superior has gotten stale. He’d much rather spend his days with beautiful and popular Jade. However, she’s dating the brash high-school quarterback Nolan, and Wyatt thinks he doesn’t stand a chance. But everything changes when Wyatt and his friends are invited to attend the grand opening of Monsterland, a groundbreaking theme park where guests can interact with vampires in Vampire Village, be chased by werewolves on the River Run, and walk among the dead in Zombieville. With real werewolves, vampires and zombies as the main attractions, what could possibly go wrong? How did you come up with the story? Monsterland was a figment of my imagination just two years ago. In the summer of 2015, I was watching an 80s & 90s movie marathon with my son. The movies were The Goonies, Gremlins, Back the Future and Jurassic Park. I always wanted to write a monster book but never had a good idea for a story. While watching, it literally popped into my head, why isn’t there a theme park with zombies. I called my brother immediately and told him my idea. He said no, it has to be a theme park with werewolves, vampires AND zombies. I started beating out the story to Monsterland that night. What did your research for Monsterland entail? I’m a big movie buff. I went back to all the horror movies of the 40s, 50s and 60s. I was creating my own universe with Monsterland, so I wanted to do something completely different than the usual tropes readers are used to reading with monsters. Vampires are rock stars. Werewolves don’t want to be bothered by anyone. And zombies (the vitality-challenged) are humans with a bad disease that makes them crave flesh. Which character do you relate to most? Is there a bit of you reflected in the characters? There is a bit of myself in all of my characters, namely the teens Wyatt, Howard Drucker and Melvin. I always liked living on the fringe, never being the center of the cool kids. A lot of what these teens are going through in Monsterland are similar experiences I’ve had in high school and college. I’m a sucker for self-help and law of attraction books. I also read a lot (and I mean a TON) of screenplays. I love the craft of story-telling, and love how stories are structured. Which writers have inspired your own work as an author? I am a huge Michael Crichton and William Goldman fan. Also, many screenwriters are huge inspirations to me - Quentin Tarantino, Scott Rosenberg, Diablo Cody, and Brian Koppelman & David Levien, just to name a few. Do you believe in writing every day as a standard practice? Tell us about your writing schedule and a typical day at the desk of Michael Okon. Absolutely. I believe research and development is what makes the difference between a good storyteller and a great storyteller. My day begins early – 6am. I make breakfast – typically bacon and eggs. I kiss my wife and kids goodbye- and make the long trek to my den with my laptop. I will research my subject from 9am to 4pm ad nauseum. I have to know everything about my characters, their arcs, the background settings, etc…I beat out my entire story before writing the words Chapter 1. The kids get home from school; I cook dinner always, generally steak. I take a break from research and development. Play with my kids. Then its baths, showers and reading time. I tuck them in, and then tuck my wife in – then I write until my eyes go, every single night. What are your thoughts on writing groups and critique partners? Mandatory. Having help will only tighten up your story even further. My brother is a huge ideas guy so when I’m stuck or don’t know where the character has to go, he will give me a little nugget of information that nudges me in a direction. Some ideas I take, others I don’t. But having someone being able to critique your work is very helpful. My mom is also a tremendous help. She can zero in on any mistake I made – a character wasn’t in a certain scene, a repetitive word…little things like that make a huge difference in writing when you’re surrounded by people who can help you. What can you tell us about your publishing experience and where do you see publishing going in the future? Well, I am a published author – it seems pretty crazy to say. I was rejected by all the big commercial publishers, and to be honest, it was expected. I really didn’t expect them to welcome me with open arms – even though I wrote a book about a theme park with monsters. My literary agent got my book into WordFire Press, and they have been wonderful to work with. The owner of the press, Kevin J. Anderson, helped me edit Monsterland and guided me along the way. He has written dozens of books in the Star Wars and Dune universes, so he knew what he was doing. As regards to the future of publishing, I’m a newbie in this world, so I’m not 100% sure. I feel self-publishing made a bit of dent in the publishing world, but there is no comparison in being a published author and a self-published author. There is a level of professionalism in the publishing industry that you don’t get in the self-publishing industry. What does success look like to you in today’s literary world? Success is relative to the person. I can only speak to my own experience. When I self-published my first self-help book, Just Ask the Universe, I thought I made it. Especially when it became Number 2 on Amazon’s best seller list in Spirituality. I didn’t think I could go any higher. Then I started taking my old screenplays and started fleshing them out into novels. I started writing under a pen name Michael Phillip Cash. One book – Monsterland – was noticed, and started to gain momentum. Now I have a literary agent, film agent, an entertainment attorney, and a possible movie deal. However, writers who don’t have these things could think that their careers are a success. My success, going from an indie author to a published author, and may have the chance to see their book adapted to the big screen – well, to me, that’s pretty successful. How do you handle constructive criticism or negative feedback on your work? Love it. If anyone takes time out of their schedule to read my book, I expect only the truest criticism they can provide. If it’s negative, I take what they say and try to learn for my next book. If it’s just a troll who is trying to bash me, I laugh and move on. What is the best piece of advice you’ve ever received, about writing, or about life in general? There is a thinking stuff from which all things are made, and which, in its original state, permeates, penetrates and fills the interspaces of the Universe. This is from Wallace D. Wattles book The Science of Getting Rich. Anyone can be anything they want to be, as long as they’re thinking the right way. I use this quote as the foundation to everything I do in life. In the end, everything will be OK. And if it’s not OK, it’s not the end. John Paul Dejora said that. Writing is like living on a roller coaster. There will be ups and downs. Things may not be OK sometimes, but that’s all right. Because if things are not OK, your story isn’t over yet. What’s next? Do you have another project in the works? Monsterland 2 is in the books, and will be coming out on my birthday May 26, 2018. I am knee-deep in Monsterland 3. I’ve also started beating out Monsterland 4 and 5. I have 8 books planned in the series. I also have two other manuscripts ready to go. One is called Dragged Down Deep – think Indiana Jones meets Creature from the Black Lagoon, and the other is called Whillpower – about a superhero high school. I plan on writing about monsters though, for the foreseeable future. Where can readers connect with you on social media? I appreciate all the insightful questions. I came so far as an author in the last two years, I cannot wait to see what happens in the next two years.